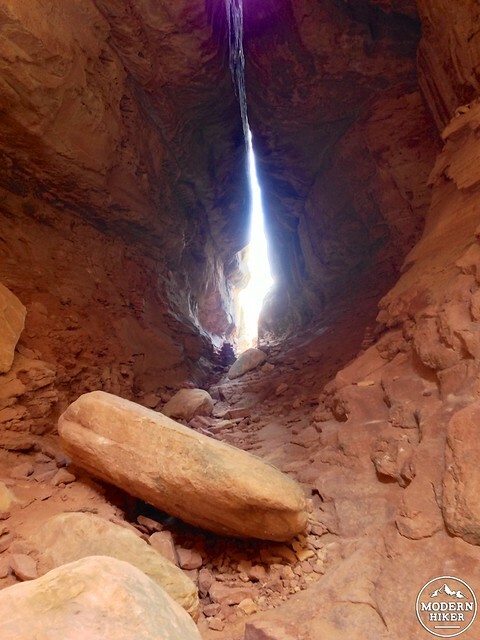 This 10.4 mile loop takes you into some of the most seemingly unnavigable terrain in Canyonlands, through a series of impossibly shaped canyons surrounded by otherworldly, melting-ice-cream rock formations through a broad, grassy meadow that seems to come out of nowhere … then drops you underground into the Joint Trail, where you’ll have to squeeze through shoulder-width cracks in giant boulders. This is one of my all-time favorite trails, and I’m pretty certain the entire time I was hiking it I had a giant grin on my face. I’m willing to bet you’ll have a similar experience. The trail starts at Soda Spring at the Elephant Hill Trailhead, reached after driving over a navigable but still semi-harrowing dirt road for 3 miles. The trailhead is clearly marked, and you’ll probably hear 4WD ATVs revving their engines as they continue on the challenging drive to Devil’s Kitchen Campground. Don’t worry about noise, though – the trail and the 4WD road head off in different directions. 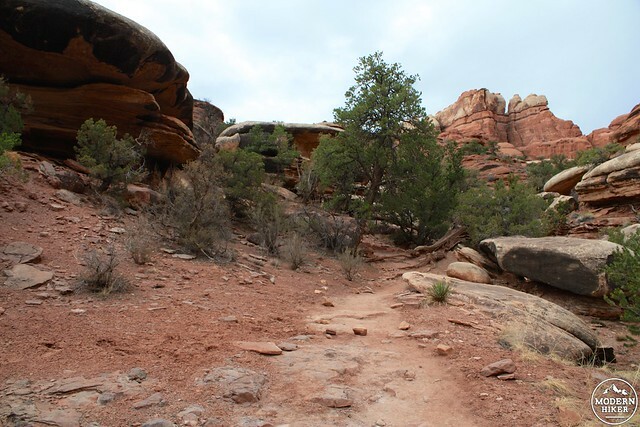 You’ll start off on a rough dirt and slickrock trail that initially looks mostly similar to other trails in the region. 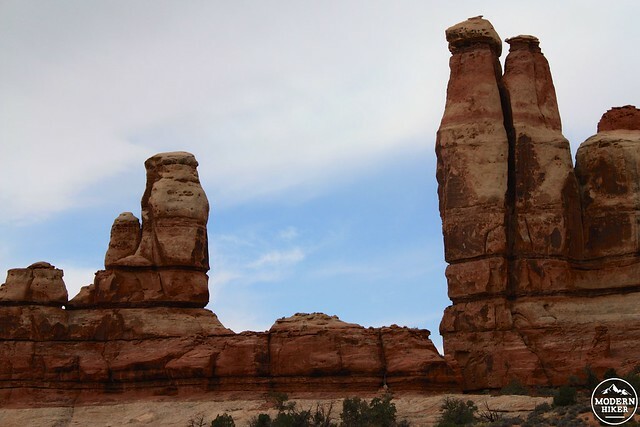 But as the trail climbs and snakes through some of these rock formations, it will eventually deposit you on top of them – and that’s where you get your first idea of just how weird everything looks over here. 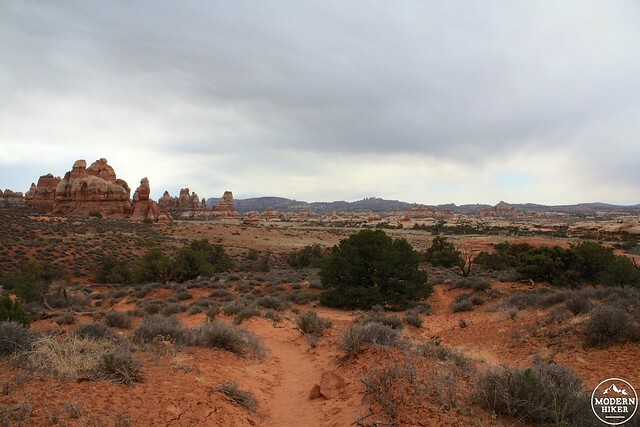 The trail continues climbing, and by the half-mile mark you’ll see rising hulk of Elephant Hill … as well as a glimpse of the seemingly impenetrable Needles formation that you’ll be hiking right through in just a few miles. 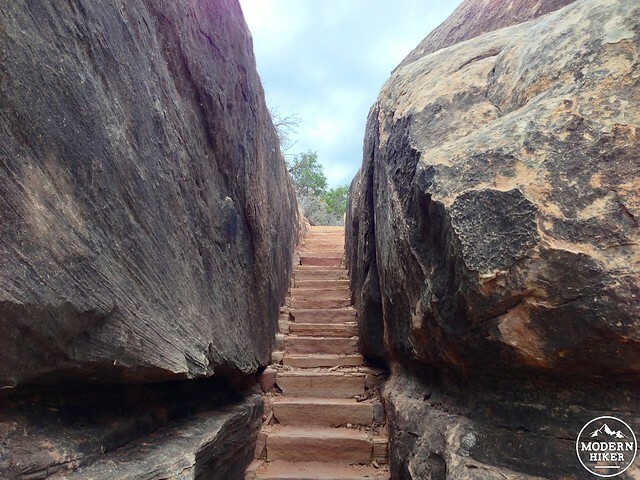 Most of the first mile and a half of the trail is spent following a faint trail in the dirt or chasing cairns from rock to rock … with the occasional narrow staircase through some boulders thrown in for good measure. At the 1.5 mile mark, you’ll also hit your first junction with the veritable spider web of trails that criss-crosses the entire region. 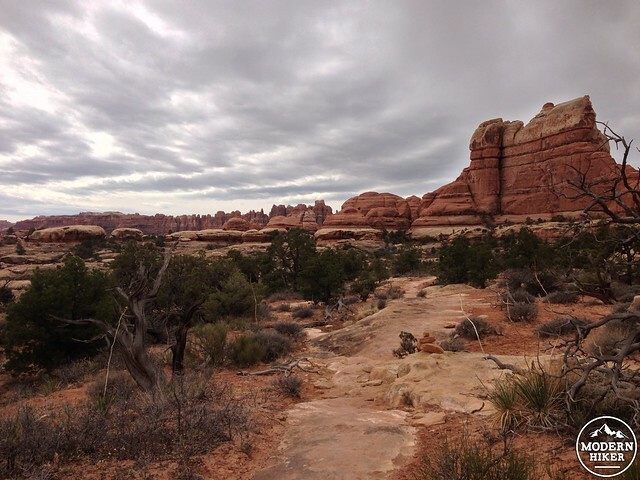 Stay to the right to continue hiking toward Chesler Park as the trail descends into a wash in about another half mile. 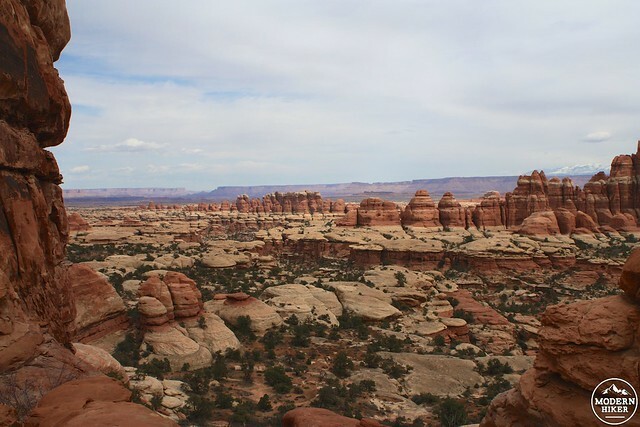 Just north of this wash is the first backcountry campsite on this route (Camp EC1 – permit required), and to the south is the trail to Druid Arch, an impressive sandstone formation at the end of another narrow canyon. 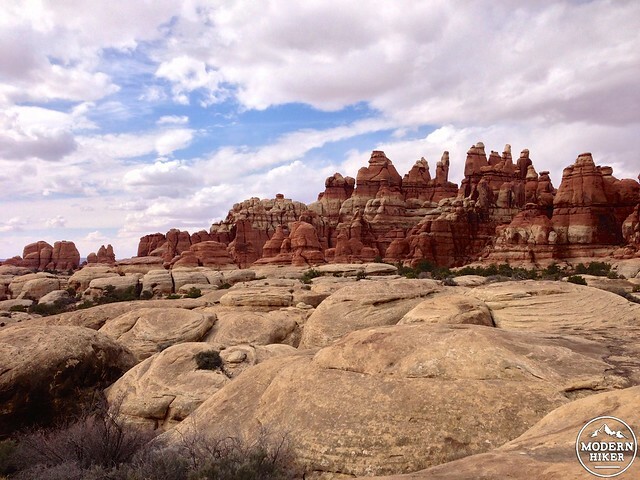 It’s a worthy side trip but if you head to it from here you’ll miss the entire Chesler Park section, so instead continue hiking to the west as the trail climbs back up out of the wash. 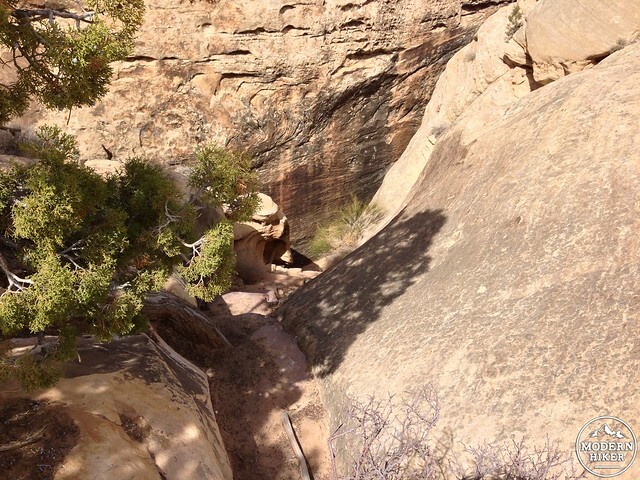 The trail makes a relatively steep ascent climbing out of the wash. There are some steep drop-offs and tight switchbacks but nothing that’s inherently dangerous as long as you watch where you’re hiking. 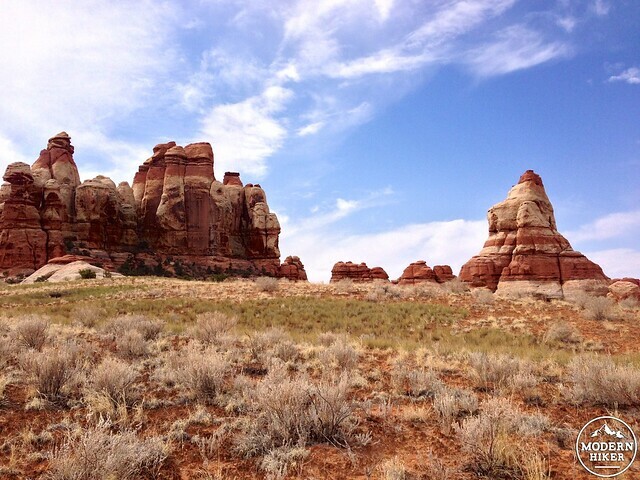 At the 2.4 mile mark, stay to the left to climb up through two large spires and venture into the Needles. This is one of the highest points on the hike, and a great place to stop to look around at the terrain you’ve already hiked through. 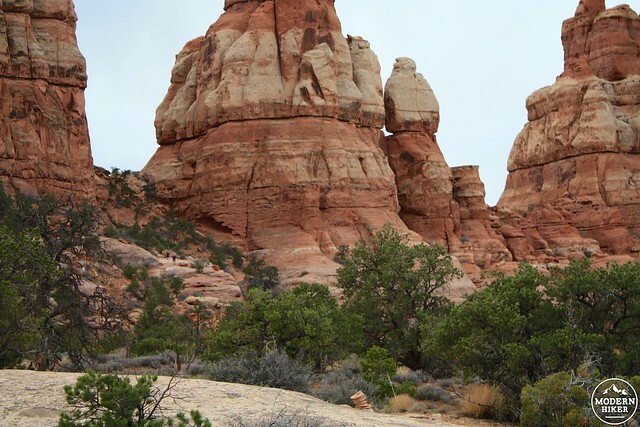 And finally – at the 2.5 mile mark – you’ll walk through the Needles formations and see Chesler Park for the first time – a large, broad valley filled with scrub, chaparral, and grasses and surrounded on almost every side with towering multicolored rock formations. You’ll want to take a minute to soak it all in. 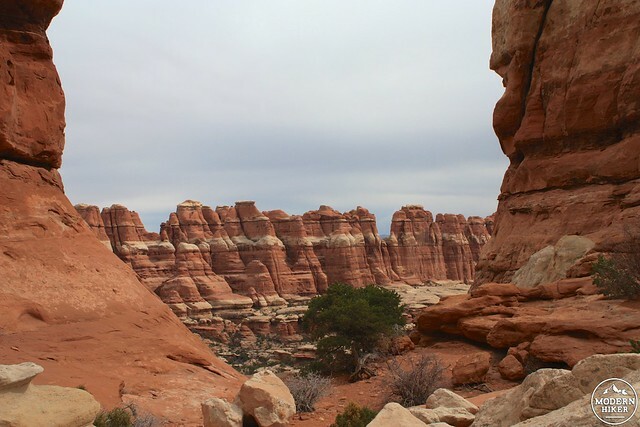 From here, the trail descends inside of Chesler Park and makes a clockwise route that begins by hugging the rocky northeastern perimeter of the valley. You’ll pass another backcountry camp site in this northeastern section (CP1), as well as getting to explore some cracks in the rock formations that allow you to gaze back at where you started your hike. Follow the trail as it bends to the southwest, cutting directly across the grassland. As you hike across the broad plain, be sure to look to the west where, on a clear day, you can see across the Colorado River deep into The Fins of the Maze District. 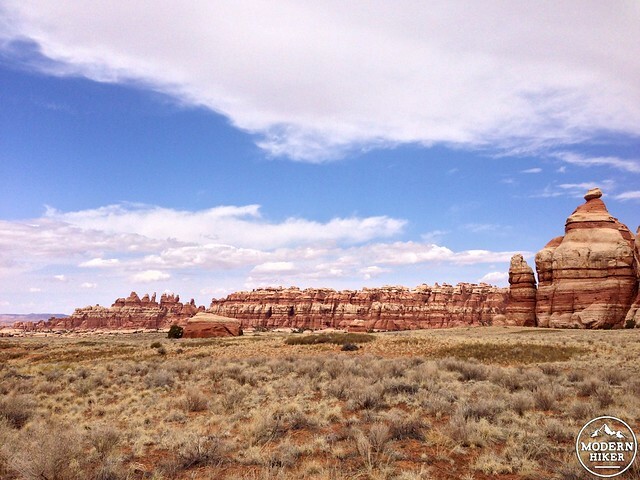 From here, in the open space of Chesler Park, you’ll have some phenomenal opportunities to soak in the full beauty of the valley. I mean, look at this! At the 4 mile mark, stay to the right to hike on the Joint Trail. But if you were looking for a side trip to Druid Arch, this is the place to take it – but be warned, backtracking back to the Joint Trail would be a 5 mile round trip. It’s more realistic, I think, to do the Joint Trail and Druid Arch as separate trips – or from a base camp inside Chesler Park. 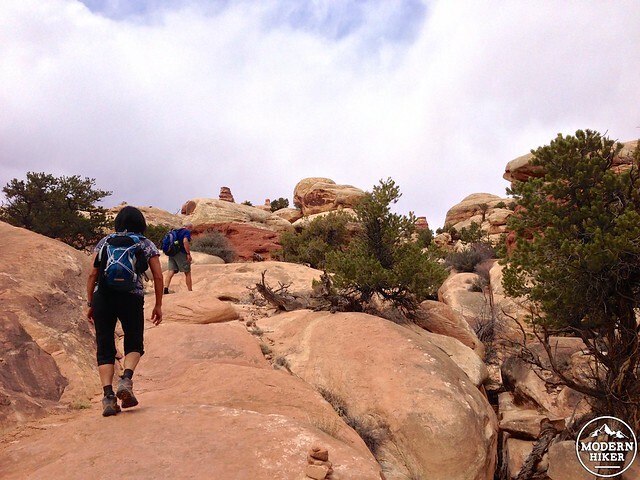 Back to the Joint – the Joint is an incredibly fun mile and a half stretch of trail that descends below Chesler Park and squeezes its way through enormous boulders – sometimes only with a shoulder’s width between them. It’s one of the best trails in the entire Park, and one of the best things about it is you can’t even see it until you’re right on top of it. 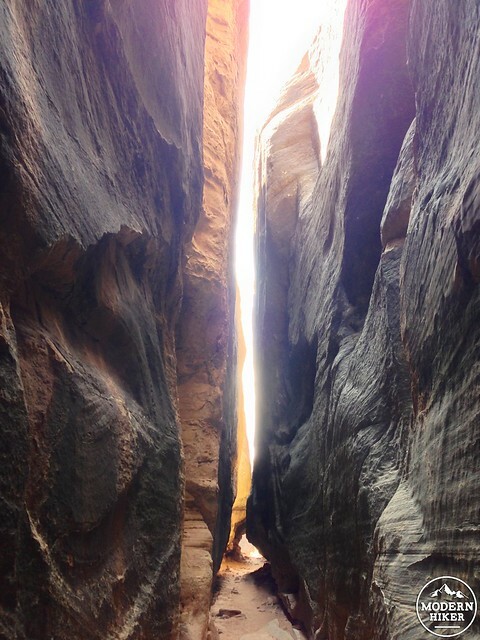 Once you get inside the Joint Trail, this hike becomes an entirely different experience. 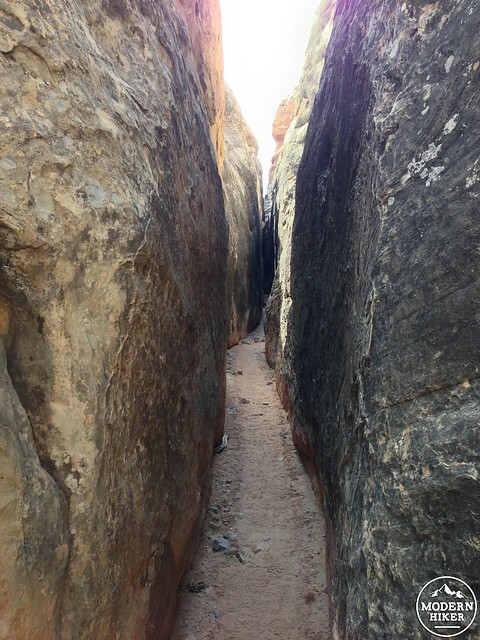 The strange multicolored rocks and wide open vistas of canyons and mesas all fade away into the distance as you descend into a few-foot wide crack between two giant boulders. You’ll walk along the sandy bottom here – occasionally climbing down some short wooden ladders or scrambling around boulder formations. 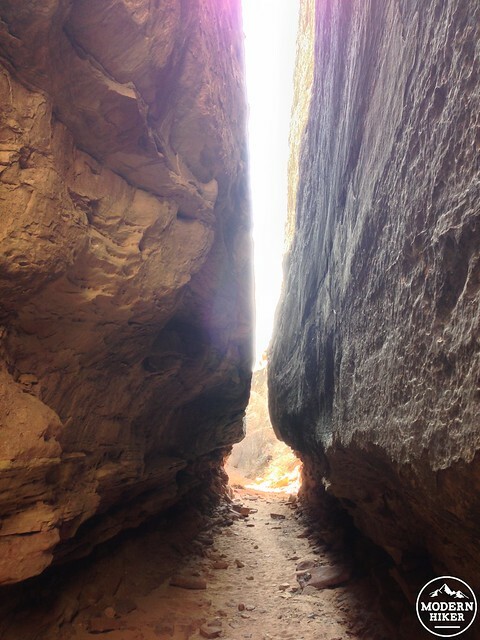 The width of the Joint Trail is variable – sometimes it feels like you’re in a giant cave, while other times you’ll have to shimmy sideways to continue on the trail. Keep an eye out for cairns marking the proper path along the way – but if you take a wrong turn here you’ll hit a dead end fairly quickly. 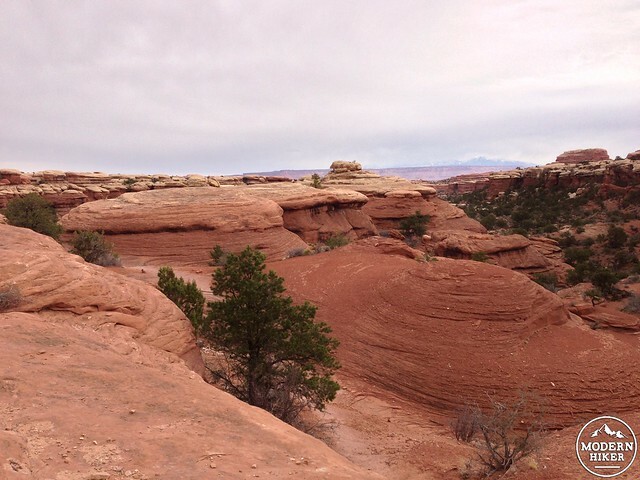 When the trail breaks free of the boulders around the 4.5 mile mark, you’ll find yourself once again meandering through the rock formations and low washes of the Needles formations. The single track eventually turns into a broad, very rough 4WD road and at the 5.84 mark you’ll reach a small picnic area along the 4WD road. It has a bit of shade, some picnic tables, and an outhouse, and makes for a nice break before continuing the Chesler Park Loop. 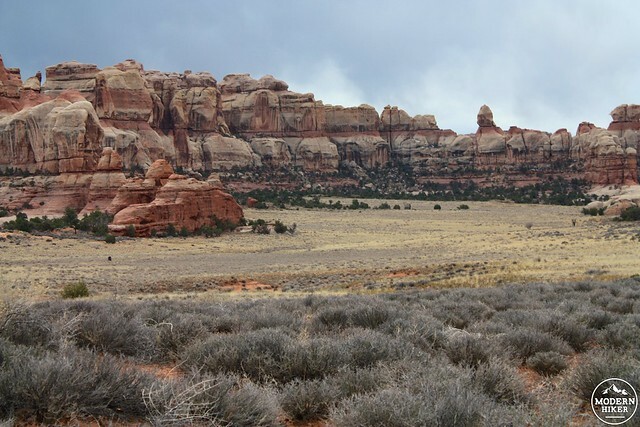 The trail leaves the 4WD road just 0.4 miles after the picnic area, at which point you’ll find yourself climbing and walking across the slickrock bottoms of the rock formations that make the northern boundary of Chesler. Just before the 6.5 mile mark, ignore the trail to Devil’s Kitchen Camp and stay to the right to continue back toward Elephant Hill. 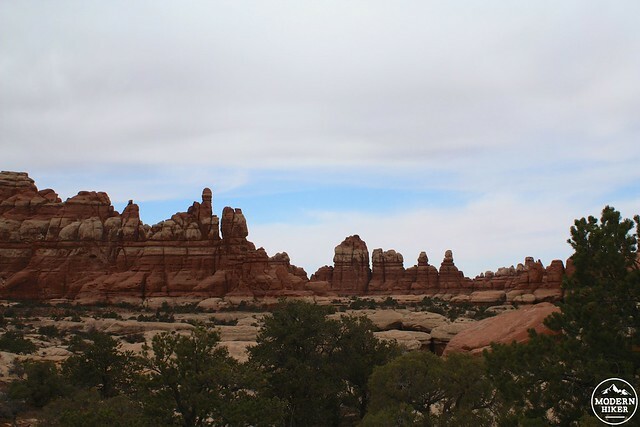 You’ll gain a fair amount of elevation on the return as you clamor up, over, and through the Needles – but it’s not terribly difficult and, as you’ve noticed by now, the scenery is phenomenal. At the 7.7 mile mark you’ll rejoin the northern end of the Chesler Park Loop. 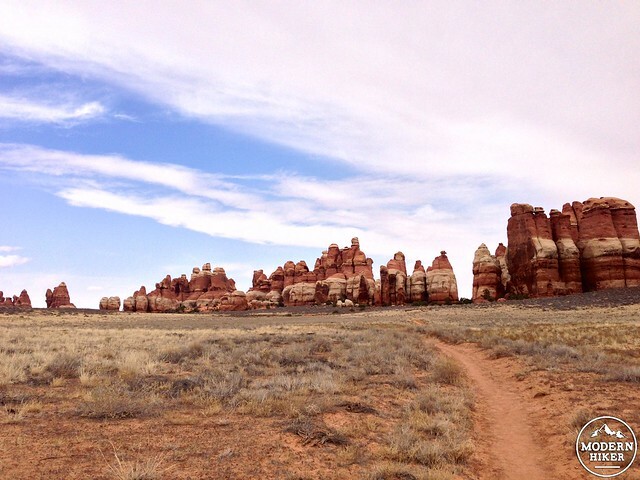 Return back through the saddle and stay on the Chesler Park Trail on your way back to the trailhead. Good. This is a popular route and the trails are well-worn, if not always well-signed. However, there are lots of trail junctions and use-trails - and plenty of places where a wrong turn could get you lost. Be sure to bring a map, know the route, and pay attention on the trail. 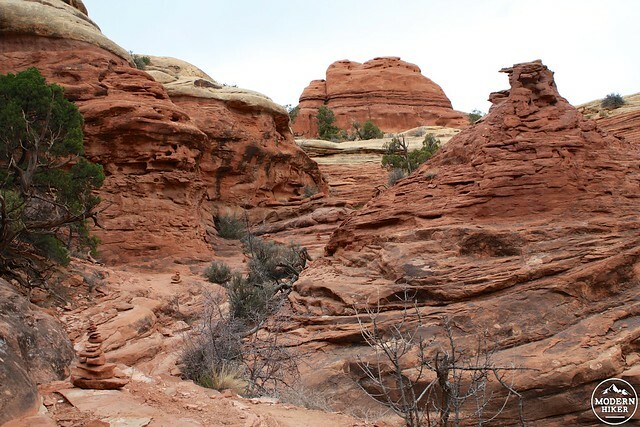 There are least six small, primitive, walk-in campgrounds along this route - and you're within spitting distance of at least three more depending on how far you'd like to explore the Elephant Canyon region. The closest developed campground is at Squaw Flat, and is also first-come, first-served. The privately owned Needles Outpost is just outside the park's entrance and offers reservable campgrounds along with gas, food, and showers. When I was here I used the Needles Outpost as my home base and had a very pleasant experience, although a quick search on Yelp or TripAdvisor will give you some interesting alternate experiences. The trailhead is at Soda Spring just below Elephant Hill - which is about as far west as you can drive in a passenger car in the Needles District. After paying the entrance fee, continue west on UT-211 toward Roadside Ruin. In 2.8 miles, turn left toward Squaw Flat. In 0.3 mile, keep right. Pass the campground and join Elephant Hill Access Road - a narrow and winding road that is occasionally single lane. The road is passable for 2WD vehicles until Elephant Hill. Casey, you were absolutely right about this being an amazing hike. My friend and I just finished spending a week hiking throughout UT and we declared this to be the BEST. HIKE. EVER. 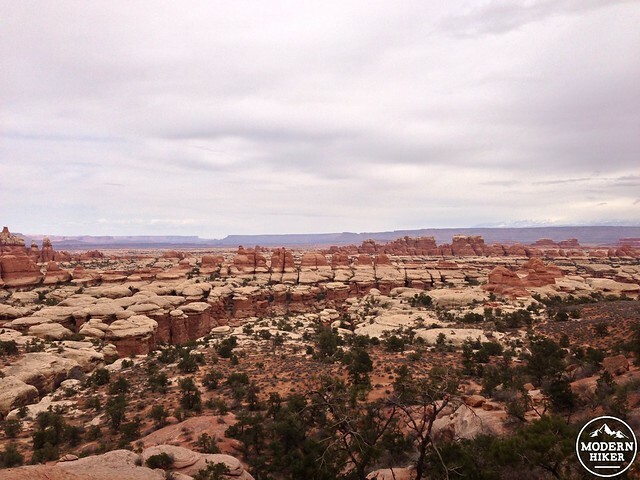 We saw gorgeous places all week (Zion, Bryce, Arches, Dead Horse), and nothing compares to this loop. Enjoyed every single second of it. I've already told my kids that we are coming back next summer and doing this loop. Thanks for the great write up and recommendation! I can't tell who I am replying to, so I will reply to both Casey and Zoe here. Thanks a million for the info! That makes the decision easy. I am glad to hear that the Chesler Loop hike is not that bad. When they are classified as strenuous, sometimes it's hard to know if that's just because of the length, or if they mean you need more strength or technical skills. Thanks again both of you for taking the time to reply! I did both; I'd recommend sticking to Chesler. Druid Arch was a nice hike through Elephant Canyon, but it's really just that: a few miles through the wash. The ladders on the way up are fun, but we lost the trail for a second and tried to make our own. When that failed we turned around but then finally spied the right cairns. I was pretty disappointed that the hike only gives you a descent view of the arch, but doesn't actually get you up to it. It was mostly just a time constraint - I didn't have a headlamp with me so I just chose Chesler and the Joint Trail over Druid Arch for this trip. I will say I had a LOT of fun on the Joint Trail and the Park itself is really beautiful. 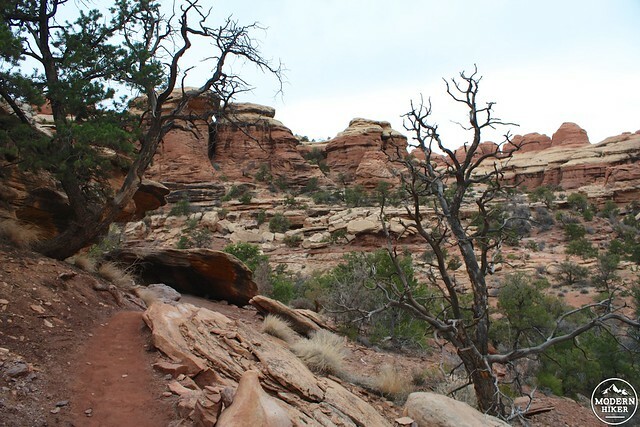 The most difficult parts of the Chesler Park loop are route-finding and squeezing through the spaces in the Joint Trail but neither one is super tough other than the fact that it's a long hike. Hi Casey! I am so glad I found your site! 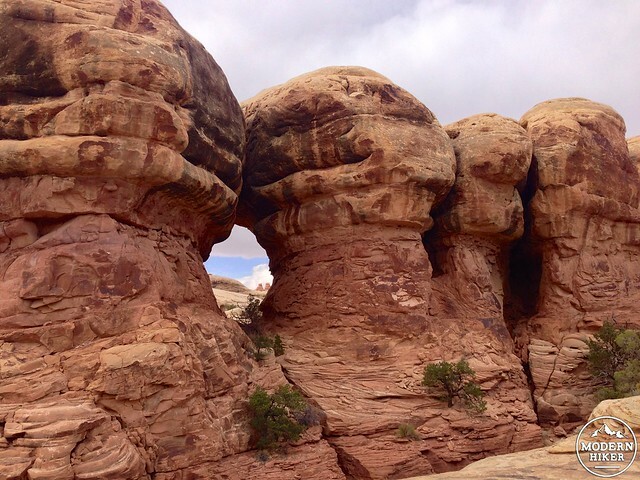 Can I conclude from this post that if you had to choose between hiking to Druid Arch or doing the Chesler Loop, you find the Chesler Loop more scenic/impressive? Also, which hike is more difficult? (I am going with my 69-year old mom.) Thanks! We did this as part of an overnight hike. 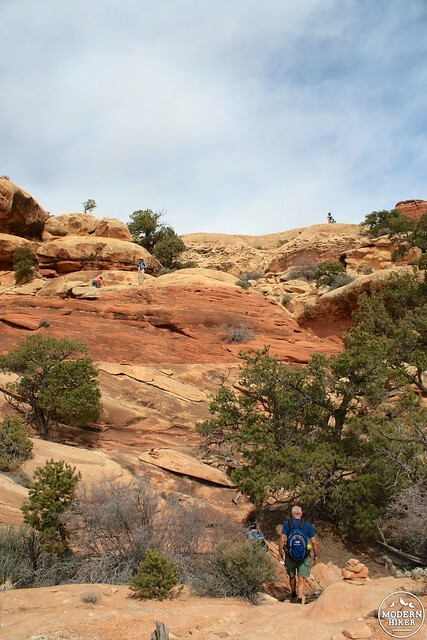 We started at the Elephant Canyon trailhead and set up camp at EC3, then came out this way. We were here in mid-July, made it to the Joint Trail around noon, so we ate lunch and played cards and read for a bit there until around 3 while we waited for it to cool back down. We took the ascent to Druid Arch, as well. The only bad news was that we were there right in the middle of monsoon season and got rained out and had to hike back to our car in the middle of the night. It was quite an adventure! talk about perfect timing! You're going to love this place - I'm itching to go back to explore more of those side canyons. A longtime bucket-list hike that I'm finally going to be able to take, in about 10 days' time. This is a great orientation package ... I'm grateful for it.